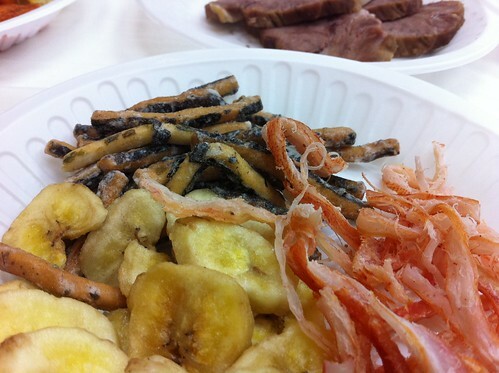 There are some aspects of Korean food culture that not everyone who comes here gets to see. I happened to go to a Korean wake (sadly not my first and most definitely not my last) about a month ago and thought I would share just a few pictures of what was served. When someone dies in Korea there is usually an area set aside in the hospital for friends and family to visit and pay their respects. Over a period of two or three days and nights, guests come and pray at an altar and then head to a dining area for a meal and perhaps a drink or two. The family of the bereaved will normally spend the whole time at the hospital greeting guests day and night. 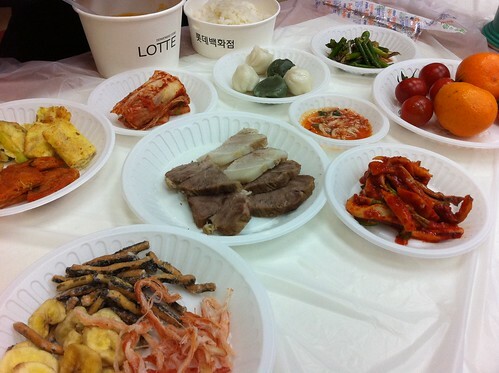 Visitors will usually be given a bowl of soup, a bowl of rice and a variety of side dishes to snack on. 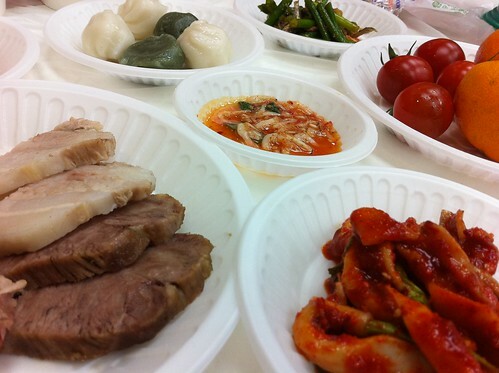 There will almost always be some steamed meat, some pancakes, some rice cakes and a selection of fresh fruit. There's beer and soju on hand for those who want to drink to the memory of the deceased, with the normal dried snacks you might see at bars across the country. There's something quite comforting about this tradition, people come and go, chatting amongst themselves and paying their respects. Many visitors lend a helping hand with serving food and drink, and the three days give people coming from out of town enough time to visit. Not the happiest of meals, but an important one nonetheless. I sometimes think that western funerals are very rushed which can leave a lot of baggage behind. When I look at other traditions around the world including the Maori culture of New Zealand where I am from, time is taken for loved ones to grieve and somehow come to terms with what has happened. I have also experienced this personally and found it comforting. Thanks for the post. Yes funeral food never is a happy meal but important one. Every culture has its own funeral traditions. Food served on the funerals are different according to the customs of the culture but nevertheless there is one ruling thought behind funeral foods, these are for comforting the grieving family and friends who are paying visit and attending the funeral.